During the entire build-up to Director Roar Uthaug's film reboot of Tomb Raider, many fans had brought up the original Angelina Jolie pair of films as a comparison, assuming those movies, on some level, served as a baseline of quality for future said comparisons. Having recently watched the original film and its lesser sequel, I can easily say that filmmaking, in almost every respect, has evolved considerably in the past 15 years. It is also worth pointing out that the Lara Croft that Jolie played way back when is a very different character from a different era than what we witnessed in the 2013 video game reboot, which serves as the basis for this new potential film franchise. This version of Lara is brilliantly portrayed on-screen by Alicia Vikander, but through a ho-hum script that only shows a small glimmer to what a true Tomb Raider film can be. I've been a big fan of Alicia Vikander ever since Guy Ritchie's 2015 masterpiece, The Man from Uncle. I also enjoyed her in Ex Machina, despite me being a bit lukewarm on that particular film. Vikander, as the titular Lara Croft, puts her entire being into this role, showing a massive degree of determination and dedication into making this version of the character come to life on the big screen like never before. This effort, however; can almost make it feel as if she is the only one really putting in a solid effort into their performance as several of the supporting cast just don't measure up to what Vikander is bringing to the role. This version of Lara is tough, yet vulnerable, a young woman who is still coming to grips with the loss of her father, a theme that runs parallel to several characters as the narrative of parental abandonment is attached to each of the main cast. The film opens up with a non-stop barrage of 'Let's see what can Lara do' as we are shown various things like kickboxing, being quick to think in a fast-paced bicycle-race, as well as attempting to get back some stolen belongings on a Hong Kong pier. While I don't mind the build-up to an origin story showing elements of what will come into play during the film, it simply takes far too long to get Lara to the island, missing the opportunity to adopt more elements of the survival aspect of the reboot. Had the entire fox-hunt bicycle race been removed, then I strongly believe the film would have had more time to stay interesting and get to where the film is at its best, the island. Despite the original Tomb Raider films coming out some 17 years ago, those movies adopted the feel of what video game and comic book movies were at the time. The action was cheesy, as was the acting, the visual effects laughable, and the movies never lived up to the solid action films of what came before. Uthaug's direction with this latest film gives off vibes of classic 80's and 90's action films, in a way that works well here. While the script by Evan Daugherty, Alastair Siddons, and Geneva Robertson-Dworet isn't terribly interesting, the action elements and character work here simply reminds me of that era of action films. The story in Tomb Raider doesn't quite live up to that of the game it is inspired by. It lacks a solid cast of memorable characters and changes several important aspects of the main character, her motivations, and her past. Here, in the film, Lara isn't a student of ancient studies or even has an interest in archeology at all. In the game, she seeks out the mysterious island of Yamatai for the thrill of uncovering its secrets, here, she travels to the island in search of her father, who went missing 7 years prior and is presumed dead. The character of Mathias is drastically changed in a way that it's clear they simply wanted to use a name that was part of the reboot. Even the lore built around Himiko, the body that lies within an ancient and cursed crypt, is changed to suit the needs of the story. Quite simply put, Alicia Vikander is the best thing about this movie but the same can't be said for her supporting cast. Dominic West as her father, Richard James Croft is entirely predictable and comes off as a very by-the-book character given the circumstances we find him in. Walton Goggins, who has a varied history of playing the bad guy has a few moments of strong characterization, but then the film decides to push him into the same direction that villains of this genre usually go. 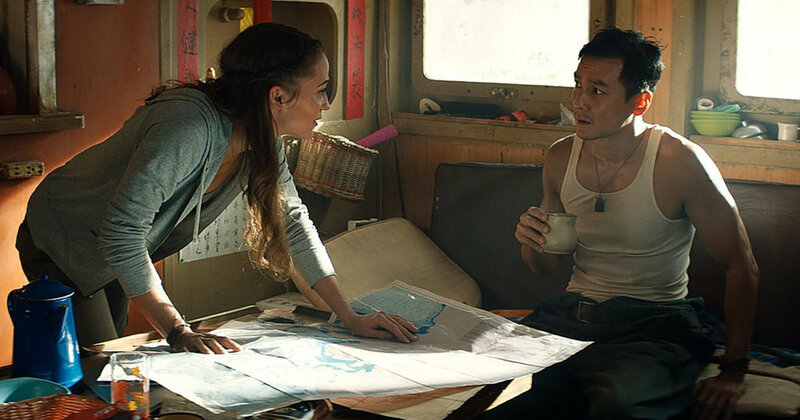 Daniel Wu as Lu Ren, the Captain of the Endurance, which thankfully shares the name of the boat in the game, starts out strong but then is completely forgotten about during the final act. You have small roles in the movie for Nick Frost and Killjoy's Hannah John-Kamen, with the latter being in the film for maybe two minutes. There are several strong action moments as well as a few emotional scenes, with one of them feeling a bit hollow after the fact. When Lara takes her first life, in a moment of self-defense, the moment is powerful and emotional, but it's not long before Lara is one-shotting mercenaries with her bow and killing them one by one. While this is typical of games like Tomb Raider and to a large degree with the Uncharted series, the transition here is poorly implemented and she becomes this instant killer far too easily. I've mention time and time again that the film starts to really come together when Lara gets to the island because, quite frankly, it's what works to its advantage. I really wished the movie had started on the boat with Lara on her quest from the start with bits and pieces told to us as to why. When Lara is finally in the central tomb of the movie and starts to piece together the puzzles, the movie is fantastic, and hopefully, we get more of this type of stuff in the sequel, should there ever be one. The visual effects that come with this supernatural aspect are fairly thin and instead much of the visual flair the film throws at us is Lara trying to escape a crumbling old plane atop a waterfall in a very Uncharted type of moment. As my local theatre only has one Ultra AVX room, I saw the film in 3D, and frankly, there isn't really any depth to the format used here. Nothing seemed to pop off the screen and was probably only attached to the film to increase the ticket price and towards a bigger opening weekend total. There is a certain suspension of disbelief that needs to be kept in check when watching this film in order for certain moments to not ruin the experience. When Lara has the side of her stomach punctured from falling through some tree branches, she is in dire pain and requiring leagues of medical assistance, but soon after she is sprinting through the trees with not an inch of pain registering on her face. There are also some choices certain characters make during the movie that seem absurd and only seem to exist to push the plot forward regardless of their logic. It is also complete nonsense that Lara doesn't break a single bone considering the sheer velocity of some of the events her body is put through. Tomb Raider is and can be, an enjoyable film once Lara gets to the island, and yes, I am aware I've said this like eight times already, but it's true. The changes to the character from the game it is based on don't quite make sense considering Lara is heading to the same island to in some ways tackle the same journey. Vikander is solid in the role and the dedication she gives to becoming Lara Croft is felt in every scene of this movie and I would love to see how she continues that in a follow-up, but I'm not sure if the film will perform to the level that I think the studio wants from it. Tomb Raider is an alright movie but if they were attempting to be this generation's Indiana Jones, then they are simply not going about it the right way.